Background/aim Diastasis recti abdominis (DRA) is defined as a separation of the 2 muscle bellies of rectus abdominis. To date there is scant knowledge on prevalence, risk factors, and consequences of the condition. The present study aimed to investigate the prevalence of DRA during pregnancy and post partum, presence of possible risk factors, and the occurrence of lumbopelvic pain among women with and without DRA. Methods This prospective cohort study followed 300 first-time pregnant women from pregnancy till 12 months post partum. Data were collected by electronic questionnaire and clinical examinations. DRA was defined as a palpated separation of ≥2 fingerbreadths either 4.5 cm above, at or 4.5 cm below the umbilicus. Women with and without DRA were compared with independent samples Student's t-test and χ2/Fisher exact test, and OR with significance level >0.05. Results Prevalence of DRA was 33.1%, 60.0%, 45.4%, and 32.6% at gestation week 21, 6 weeks, 6 months and 12 months post partum, respectively. No difference in risk factors was found when comparing women with and without DRA. OR showed a greater likelihood for DRA among women reporting heavy lifting ≥20 times weekly (OR 2.18 95% CI 1.05 to 4.52). There was no difference in reported lumbopelvic pain (p=0.10) in women with and without DRA. Conclusions Prevalence of mild DRA was high both during pregnancy and after childbirth. Women with and without DRA reported the same amount of lumbopelvic pain 12 months post partum. The aims of the present study were: (1) to investigate the prevalence of DRA among nulliparous pregnant women during pregnancy and the first year post partum; (2) to investigate the presence of possible risk factors among women with and without DRA 12 months post partum and (3) to investigate report of lumbopelvic pain among women with and without DRA 12 months post partum. The study was part of a cohort study at Akershus University Hospital (Ahus), Norway. All first-time mothers with planned birthplace at the hospital in the period from January 2010 to April 2011 were invited to participate in the study.16 ,17 Data were collected by electronic questionnaire at gestation week 21 in addition to 6 weeks, 6 months and 12 months post partum. At these four assessment points, clinical examinations were carried out by two physiotherapists. Data on delivery mode and the baby’s birth weight were collected from the women's electronic medical journal at the hospital. The cohort study was approved by the Regional Medical Ethics Committee (2009/170), and the Data Protection Officer at Ahus (2799026). All women gave written informed consent before entering the study and procedures were in accordance with the Helsinki Declaration (2008). The study followed the STROBE reporting guidelines. The inclusion took place in conjunction with the routine ultrasound examination at gestation week 18–22. Inclusion criteria were women aged ≥18 years, and the ability to understand and speak a Scandinavian language. Exclusion criteria at baseline were serious illnesses, multiple pregnancies, and history of a previous pregnancy lasting >16 weeks. 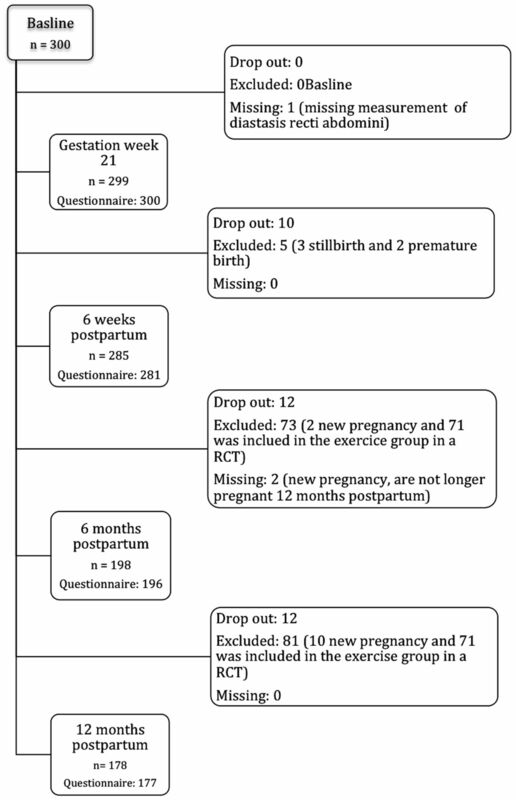 During the study period women with spontaneous abortion, stillbirth or premature birth before gestation week 32 were excluded and women included in the training group in a parallel randomised controlled trial (RCT) on pelvic floor muscles training starting 6 weeks post partum were excluded.18 Additionally, data from women with a new pregnancy of >6 weeks gestation were excluded from the analysis (figure 1). Flow chart. RCT, randomised controlled trial. The study was a planned part of a project addressing several questions related to the pelvic floor during pregnancy and after childbirth. Whereas the power calculation for the cohort study was based on expected changes in the levator hiatus area, assessed by ultrasound,19 there was no a priori power calculation for the present study on DRA. The women were classified into four categories depending on the largest measured inter-recti distance among the three locations: (1) non-DRA was set as a separation <2 fingerbreadths, (2) mild diastasis as a separation of 2–3 fingerbreadths, (3) moderate diastasis as 3–4 fingerbreadths and (4) severe diastasis as a separation of 4 or more fingerbreadths. Observed protrusion along the linea alba was categorised as DRA even if the palpated distance was <2 fingerbreadths. The categorising was based on the study by Candido et al.8 Prevalence of DRA was analysed as yes/no and mild, moderate and severe grade of DRA were merged in the main analysis. Selection of risk factors was based on existent literature and clinical reasoning. The chosen variables were: age, height, mean weight before this pregnancy, weight gain during pregnancy, delivery mode, baby's birth weight, benign joint hypermobility syndrome, heavy lifting, and level of abdominal and pelvic floor muscle exercise training and general exercise training 12 months post partum. Pain related to the low back and pelvic girdle was recorded by using an electronic questionnaire. Two yes/no questions were used: ‘Are you bothered with pain in the low back?’ and ‘Are you bothered with pain in the pelvis?’ If answering ‘yes’ on pelvic girdle pain, participants were further asked to localise the pain with the following alternatives: (1) right posterior pelvic pain, (2) left posterior pelvic pain, (3) bilateral posterior pelvic pain and/or (4) anterior pelvic pain. Pelvic girdle syndrome was defined as having anterior and bilateral posterior pain.27 In the main analysis, low back pain and/or pelvic girdle pain were conflated into lumbopelvic pain. Additionally, subanalysis of either pelvic girdle pain or low back pain was performed independently. Statistical analyses were performed using SPSS (V.21, Inc, Chicago, Illinois, USA). Background variables were reported as means with SDs or frequencies, and percentages. Women with and without DRA were compared in relation to risk factors with independent sample Student's t-test for numeric data and χ2/Fisher’s exact test for categorical variables. Logistic regression was used to calculate ORs for the different risk factors reported as OR with 95% CI. Spearman’s correlation between variables was used to investigate the basis for adjustments for possible confounding factors. Differences in report of lumbopelvic pain were compared with Fisher’s exact test. Missing data were excluded. The significance level was set to >0.05. In total, 2621 women were scheduled for delivery at Ahus during the inclusion period. The cohort consisted of 300 primiparous women of European ethnicity (96%), and between 19 and 40 years of age (table 1). The prevalence of DRA was 33.1% at gestation week 21, 60.0% 6 weeks post partum, 45.5% 6 months post partum, and 32.6% 12 months post partum (table 2). The location with the highest prevalence of DRA was at the umbilicus for all the time points. Table 3 showed no significant difference in evaluated risk factors when comparing women with and without DRA 12 months post partum. There were three borderline values: height, heavy lifting and participation in strength exercise training. The OR for DRA was twice as high among women reporting heavy lifting 20 times a week or more than that for women reporting less weight lifting (table 4). No other significant risk factors were found. Table 5 showed no difference in lumbopelvic pain among women with and without DRA 12 months post partum. Four women had pelvic girdle syndrome, and one woman had pain in the front and back on one side. At gestation week 21, 6 weeks, 6 months and 12 months post partum, the prevalence of DRA was 33.1%, 60.0%, 45.4% and 32.6%, respectively. There was a greater likelihood for DRA among women reporting to be exposed to heavy lifting 20 times a week or more calculated with OR, but no other risk factors were found to be statistically significant. Women with DRA were not more likely to report lumbopelvic pain compared with women without DRA. We have only identified two studies investigating the prevalence of DRA during pregnancy.5 ,6 Our result of 33.1% is in accordance with Boissonnault and Blaschak’s6 results of a prevalence of 27% in the second trimester. They assessed DRA with palpation at the same three locations along linea alba, and with similar cut-off values as the present study. Mota et al5 measured DRA with ultrasound during gestational week 35, and reported a prevalence of 100%. The difference in measurement method, assessment-time, and the use of 1.6 cm as cut-off value makes direct comparison between studies difficult. To the best of our knowledge, Mota et al5 is the only study reporting prevalence of DRA 6 weeks and 6 months post partum. Their results of 52.4% and 39% are lower than our result of 60% and 45.4% at the same time points. Boissonnault and Blaschak’s,6 who measured DRA 5 weeks to 3 months post partum, reported a prevalence of 36%. To the best of our knowledge, the present study is the only one assessing DRA 1 year post partum. Turan et al9 examined DRA with palpation minimum 6 months post partum and reported a prevalence of 19.7% when applying a cut-off of 2 fingerbreadths or more 3–4 cm above the umbilicus. Using the same location, the present study found a prevalence of 10.2% measured 1 year post partum (data not shown), and among all three measurement locations our result was 32.6%. Our data shows no clear risk factors for DRA 12 months post partum. The wide CI for the OR on heavy lifting indicates that this result should be interpreted with caution. In support, the same variable was only on the borderline using Fisher’s exact test and due to the multiple variables investigated in this study, the risk of a type I error is increased.34 Data on heavy lifting was collected through the questionnaire, and was neither defined nor measured directly. Some authors have discussed how frequent lifting and carrying children may cause increased strain on the abdominal wall and DRA, without providing any direct data for this hypothesis.8 Hence, this proposed risk factor needs further investigation. There was no correlation between possible confounding factors and DRA or investigated risk factors; therefore, it was considered to be of no basis for calculating adjusted OR. When comparing women with and without DRA in the present study, no difference was found in the number of women fulfilling the recommendations for general exercise, strength training or specific pelvic floor muscle training 1 year post partum. With a prevalence of DRA of above 30% at 12 months post partum, preventive and treatment strategies are likely to develop. As we did not perform a RCT we cannot, based on our data, advice women on how to prevent or treat the condition. A recent systematic review concluded that, as for now, there are no high-quality RCTs on the effect of abdominal training programmes to guide clinical practice in this area.15 Further high-quality studies regarding this prevalent condition within women's health and exercise training are therefore warranted. Several authors have postulated a relationship between DRA and low back pain,9 ,12 ,13 ,36–38 but the evidence for such an association is scant.14 Our result showed no difference between women with and without DRA, and prevalence of low back and/or pelvic girdle pain. This is in accordance with Mota et al5 and Parker et al.14 However, the latter study found an association between DRA and abdominal and pelvic region pain, and argued that the observation of no associations between DRA and low back pain might be due to inclusion of women with non-severe DRA. The maximal separation in their study was 5.02 cm, which is comparable to our result where only one woman had a separation greater than 4 fingerbreadths. Another explanation for the result of no association may be the small sample size in our study. The longitudinal design and blinding of assessors to symptoms and risk factors can be considered strengths of the study. In addition, we had a large sample size compared with other published studies in the postpartum period,5 ,6 and also investigated a sample of homogeneous primiparous women. Furthermore, two trained physiotherapists who were aware of the pitfalls of the palpation method conducted the study. Another limitation of the present study is the lack of data on the normal width of linea alba before pregnancy. However, earlier studies have shown no prevalence of DRA among nulliparous women using similar cut-off values.6 ,9 Furthermore, the use of questionnaire to diagnose low back and pelvic girdle pain may be a limitation as the diagnosis pelvic girdle pain is recommended to be confirmed through specific clinical tests.42 The use of questionnaire for exercise data is also a potential source of bias as the questions related to exercise may be prone to recall bias43 and overestimation.44 However, the recall bias in the present study was highest for prepregnancy data, and it is considered that use of questionnaires can help separate between participants fulfilling recommendations for exercise and not.43 The questions used regarding exercise are similar to those developed for the Norwegian Mother and Child Cohort Study.45 In general, there has to be caution in determining risk factors from questionnaire data; however, questionnaires are a commonly used, easy and cost-effective way of collecting information.43 Regarding the weight-related data, one weakness is that there was no direct measure of the strain on the abdominal wall. Furthermore, abdominal circumference and symphysis fundus measurements could have been relevant. Generalisability of the present study is limited because of the homogeneity of the participants included. There were no a priori power calculation for the investigated variables, but the study is one of the few longitudinal studies in the peripartum period and future power calculations can be based on results from the present study. Given the high prevalence of DRA post partum, and the concern and focus on the abdominal muscle after childbirth, there is a need for more scientifically based knowledge on consequences, prevention, and treatment of the condition. Our study did not confirm that mild diastasis caused lumbopelvic pain. However, to date, there is little knowledge on women with larger separation. Further investigation using a validated questionnaire on low back and pelvic pain in conjunction with more objective testing is required to conclusively prove this association. Prevalence of mild DRA was high both during pregnancy and after childbirth. No obvious risk factors were found, and there was no difference in report of lumbopelvic pain between the group with and without DRA 12 months post partum. There is a need for more research on the influence of DRA on abdominal strength and lumbopelvic pain, and the effect of preventative and treatment programmes. Prevalence of diastasis recti abdominis (DRA) among first-time pregnant Scandinavian women were 33.1%, 60.0%, 45.4% and 32.6% at gestation week 21, 6 weeks, 6 months and 12 months post partum, respectively. Age, height, mean weight before this pregnancy, weight gain during pregnancy, caesarean section, baby's birth weight, benign joint hypermobility syndrome, and level of abdominal and pelvic floor muscle exercise training and general exercise training 12 months post partum were not found to be risk factors for DRA. Women with DRA were not more likely to report lumbopelvic pain compared with women without DRA 12 months after childbirth. Given the high prevalence of mild diastasis recti abdominis, coaches and healthcare providers should assess whether the condition is present in post partum women. This study indicates that mild diastasis is not associated with lumbopelvic pain, which is important information to give to women with this condition. The authors would like to thank professor of biostatistics, Ingar Holme, Department of Sports Medicine, Norwegian School of Sport Sciences, for valuable advice on statistical analyses; gynaecologist Cathrine Reimers for cleaning of data and data entry; physical therapist Kristin Gjestland, and midwife Tone Breines Simonsen for recruiting participants, clinical testing, and data entry; and gynaecologists Jette Stær-Jensen and Franziska Siafarikas for clinical testing and data entry.
. Taber's cyclopedic medical dictionary. 20 edn. Philadelphia: Davis, 2005.
. Incidence of diastasis recti abdominis during the childbearing year. Phys Ther 1988;68:1082–6.
. Interrater reliability of diastasis recti abdominis measurement. Phys Ther 1987;67:1077–9.
. Risk factors for diastasis of the recti abdominis. J Assoc Chart Physiother Womens Health 2005;97:49–54.
. Prevalence of diastasis recti abdominis in the population of young multiparous adults in Turkey. Ginekol Pol 2011;82:817–21.
. Diastasis of the recti abdominis in pregnancy: risk factors and treatment. Physiother Can 1999;51:32.
. Diastasis recti I. In: Wilder E. ed. Obstetric and gynecologic physical therapy. New York: Churchill Livingstone, 1988:63–81.
. Essential exercises for the childbearing year: a guide to health and comfort before and after your baby is born. 4th edn. Harwich: New Life Images, 1995:81–106.
. Intrarater and interrater reliability of the Beighton and Horan Joint Mobility Index. J Athl Train 2003;38:281–5.
. Clinical assessment of hypermobility of joints: assembling criteria. J Rheumatol 1992;19:115–22.
. Validation of Beighton score and prevalence of connective tissue signs in 773 Dutch children. J Rheumatol 2001;28:2726–30.
. Structure and function of the abdominal muscles in primigravid subjects during pregnancy and the immediate postbirth period. Phys Ther 1996;76:750–62.
. Forskning i medisin og biofag. Oslo: Gyldendal Akademisk, 2008:264–5. Contributors All the authors have contributed to the reporting of the work described in the article. JBS and KB are guarantors. Funding The study was funded by the South-Eastern Regional Health Authority and the Research Council of Norway. Ethics approval Regional Medical Ethics Committee (2009/170).